Taiwan will be conducting a nine-month trial run to allow Philippine passport holders to enter the country without visa beginning in November 2017 according to its press release. Your passport must have remaining validity of at least six months starting from the date of arrival in Taiwan. You must possess an onward/return air or ferry ticket. You have never been employed as a blue-collar worker in Taiwan. Valid resident or permanent resident card. Valid entry visa (may be electronic visa, which should be printed out). Resident card or visa that has expired less than 10 years prior to the date of arrival in Taiwan. For further information, you may refer here. This is also applicable to citizens of India, Vietnam, Indonesia, Myanmar, Cambodia and Laos. As for other nationalities, you may check out this page to know if you need to get a Taiwanese visa or not. If your traveling from the Philippines, you can take direct flights to Taipei from Manila, Cebu or Puerto Princesa. All flights from the Philippines touchdown at Taipei Taoyuan International Airport (TPE). The Taipei Songshan Airport (TSA) only caters to domestic flights as well as international flights to and from mainland China, Japan and South Korea. Depending on the airline and season of your travel, return flights from the Philippines to Taipei may range from PHP3,500-11,500. Red-eye flights tend to be cheaper but this may limit your transportation options to the city center. There are several public transportation options you may consider to get from TPE to downtown Taipei, which takes about 30 minutes to an hour and a half. Taoyuan MRT: The MRT ride, which takes you to Taipei Main Station in just 30 minutes, would cost NTD160 one-way. The train is equipped with Wi-Fi which is perfect to locate your hotel or download the city map offline, if you haven’t done so. The last trip on the MRT is around 11PM to 11:30PM. Taxi: Perhaps the most convenient option is to take a cab as it will take you right in front of the doorstep of your hotel. There's no shortage of taxis even if you arrive during those ungodly hours. Fare is meter-based and does not include highway toll fees. A ride to the city center would probably costs around NTD1,000-1,500. Uber: The ride-sharing services of Uber is also available in Taipei, which can take you from TPE to the city in no time for about the same cost as the taxis. Bus: There are several bus companies operating trips from TPE going to different destinations. This is the most affordable option to get to downtown Taipei at around NTD125-160. The ride will take about an hour to the Taipei Main Station. Ticket booths are located at the basement of the airport. Car Rental: There are also car rental companies available at the airport. Cost varies depending on the car type and the length of lease. Taipei Metro: Taipei has a very efficient train system that spans through the entire city. Cost per trip starts at NTD20 on single journey tickets. To save some dollars on transportation, especially if you stay a little bit longer, it’s advisable to get an EasyCard for a nonrefundable NTD100. You need to top it up upon purchase since the card is not pre-loaded. You can purchase the EasyCard at just about any Taipei Metro stations and convenience stores. As an alternative to the EasyCard, you may opt to get the TaipeiPass, which gives you unlimited rides on Taipei Metro and on Taipei City and New Taipei City buses. If you anticipate to use the buses many times during your stay or plan to go to the farthest reach of the Metro, it’s preferable to get the TaipeiPass to save a few more bucks. Buses: The bus system in Taipei is also a good way to get around the city because of its wide coverage. Plus, buses are also a great way to see the city. The EasyCard and the TaipeiPass are also acceptable modes of payment for buses. Taxi: And of course, if you don’t like familiarizing bus stops or MRT stations, there are cabs that will take you from your hotel to your desired destination. Base fare is NTD70 and per kilometer costs NTD20. There’s also a waiting cost of NTD232.5 per hour. As an example, an 8.7km trip from the Taipei Main Station to Taipei 101 would cost around NTD285. The Type A and Type B plugs are used in Taiwan. These are the same power plugs used in the United States and in the Philippines. USB ports for charging mobile devices are also common in public areas. Climb up the Elephant Mountain to get a breathtaking scene of the city and the towering Taipei 101. The hike could be agonizing but the view at the top is worth every drop of sweat. Just make sure to pack bottled water and light food because there are no stores up there. Best to arrive at any of the view decks by late afternoon to catch the time lapse-ready, Instagram-worthy and oh-so-pretty Taipei sunset. To get to the hiking trail taking the Taipei Metro, alight at Xiangshan Station (Red Line) and take Exit 2. The hike and the sights are all free. Taipei is almost synonymous to night markets. Whether to get your dinner fix, or to buy clothes, or even to update your gadget accessories, the night markets have everything in store. Take an ultimate gastronomic adventure as you walk along the alleys of the markets. You can’t miss the ice cream roll with peanut shavings (make sure to add coriander). Taiwanese fried chicken, takoyaki and shaved ice are also popular eats. If you’re feeling daring, introduce stinky tofu to your palette. There are a number of night markets but the well-known ones are Shilin Night Market and Raohe Night Market. So, if you have extremely limited time, just make sure to hit any of these two and you’re good to go. Alight at Jiantan Station (Red Line) and take Exit 1 to get to the Shilin Night Market. As for Raohe Night Market, leave Exit 5 on Songshan Station (Green Line). Night markets are free to see but cost of food and other purchases vary. See Taipei from a whole new level, literally and figuratively, at the Taipei 101 Observatory. Sitting at the 89th to 91st floors of the tower, the observatory offers visitors a 360-degree view of the Taipei metropolis with mountain range backdrops. Tickets are available at the 5th floor of the Taipei 101 Mall, where you can also check the visibility level at the top before purchasing. It is best to get up there when the skies are bright to get a better view of the city. Alternatively, you can visit at night to see the city light up its skyline. Take the Red Line and alight at, obviously, Taipei 101 Station. It costs NTD600 to get up the observatory but the mall is very much free to explore. Visit the hip Ximending district for your dose of all things trendy. This is where most of the younger Taiwanese crowd go to because of the concentration of shops, cafes, restaurants and bars within the area. Be entertained by street dancers, mascots and other performances during the day – a true testament that Taipei is never short of street acts. At night, you may hit underground clubs to cap the night off. The famed Modern Toilet Restaurant has a branch in Ximending. But a word of caution, I’d go there not for the food but for the quirky aesthetic experience. Take the Blue Line of the Taipei Metro and alight at Ximen Station, taking Exit 6 to get to Ximending. The district is free to explore but cost of food, entertainment and purchases vary. Chiang Kai Shek Memorial Hall, or CKS as the locals call it, is also a must-see when in Taipei. Join other visitors in paying homage to the former President of the Republic of China. After taking the 89-step stairs to the monument, experience a little bit of history at the ground level. I was particularly fascinated by the 1955 Cadillac on display as it was said to be donated by Filipino-Chinese and became one of Chiang’s official state cars. You can take either the Red Line or the Green Line to the CKS Memorial Hall Station and leave Exit 5. The entire Liberty Square is free to explore. One of the best way to understand a culture is through its religion. Take the time to observe the locals worship at Longshan Temple, one of the oldest Buddhist temples in Taiwan. Admire the intricate Chinese architecture while taking a glimpse of the Buddhist way of worship. To get to the temple, take the Blue Line and alight at Longshan Temple Station then take Exit 1. Visit is free. 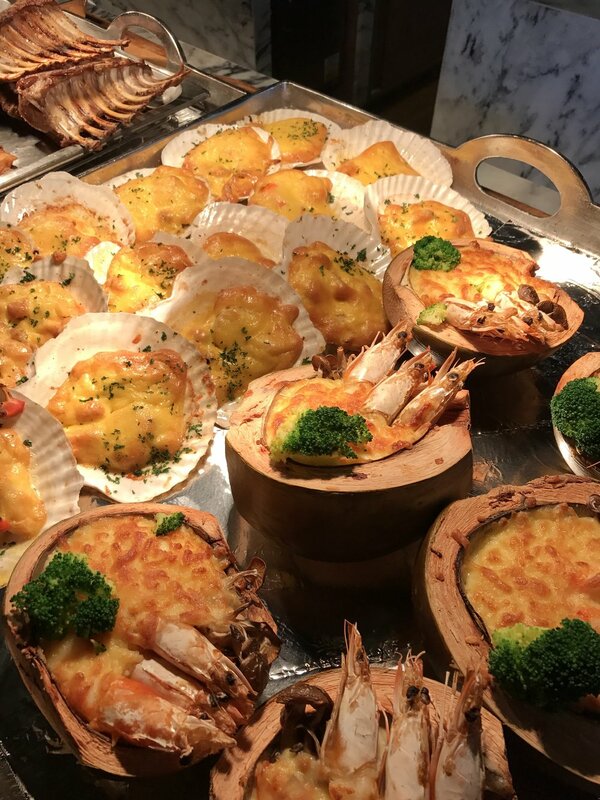 For seafood fanatics, the Addiction Aquatic Development at the Taipei Fish Market should be at the top of your itinerary. It is an upscale seafood supermarket that features live and cooked products. Fresh Japanese staples – sushi and sashimi – attracts long lines from patrons and visitors alike. On the side, you can also indulge in meat products, fresh fruits and local, as well as, imported beverage. If you don’t mind taking a 20-minute walk, you can take the Taipei Metro to the Xingtian Temple Station (Orange Line) and take Exit 3. Walk along Songjiang Road and turn right to Minzu East Road. Walk further along until you see the entrance. Otherwise, take the cab. The fish market is free to explore but cost of food and purchases vary. Rehydrate with a cup of bubble milk tea during that day-long tour. There’s no better place to enjoy this cold drink but in the country where it originated. There are tons of bubble tea shops around Taipei so you are very much free to choose and try. But as for me, 50嵐 suits my taste perfectly. A large cup of bubble milk teas costs around NTD50-60 on average. The Xinyi Shopping District transforms into a shopping paradise by day into the clubbing hub by night. HALO at the eighth floor of ATT4Fun is a good place to start. Its alfresco balcony gives you a stunning view of the nearby Taipei 101. I could only imagine how awesome to witness the New Year’s fireworks display there. For a fancier, less wild experience, try Frank at the tenth floor of the same building. Take the Red Line and alight at Taipei 101 Station. ATT4Fun is a good 5-minute walk from the station. The area that caters to, probably, all your shopping desires, the Xinyi Shopping District, is a jack of all trades. Start your retail escapade from the five stories of luxury shops at Taipei 101 Mall. Take the Red Line and alight at Taipei 101 Station. A bridge dubbed Skywalk practically connects every establishment within the area. It will take you to the hip ATT4fun, which also houses a few popular night clubs, to the Japanese department store, Shin Kong Mitsukoshi Hsinyi Place, to the trendy Breeze Song Gao, and ultimately to the über upscale The Bellavita. This path will probably break your bank for so many reasons. For more affordable and fast fashion finds, there’s the Ximending district. You can find just about any clothing item and cosmetic needs you’re looking for. Shops are side-by-side food stalls along its vine of alleys. And of course, for even more affordable buys, the various night markets will certainly not fail you. You will find not just clothes but also gadget accessories, bags and many other knickknacks. Souvenirs are also abundant at night markets.